Travel blogger Margie Goldsmith has been convertd from a cruise hater to a river cruise fan after travelling with Scenic Tours. (TRAVPR.COM) UK - November 29th, 2013 - Scenic Tours has managed to change the mind of a travel writer who hated cruises; Margie Goldsmith found herself having the time of her life on their all-inclusive Romantic Rhine and Moselle river cruise. In her Huffington Post blog, which can be read here, Margie Goldsmith tells readers that she was looking for an adventure in Europe that included visits to Amsterdam, the Black Forest and Bruges, and that she also wanted to be able to fully relax and enjoy her first anniversary with her partner. A friend recommended Scenic Tours to her and soon she set off on their Romantic Rhine and Moselle river cruise, which turned out to be her perfect relaxing getaway. Whilst the destinations in Europe were exactly what Margie Goldsmith was looking for, it was the service provided by Scenic Tours that left the strongest impression. As well as enjoying the wide range of dining options and wine pairings that she and her partner were presented with, the electrically-assisted bikes and Scenic Tailormade GPS devices allowed them to explore at their own pace when not taking part in some of the exclusive activities and excursions. Order a free brochure from Scenic Tours to find out more about the Romantic Rhine and Moselle river cruise and to take a look at all the other luxury river cruises that Scenic Tours offer. 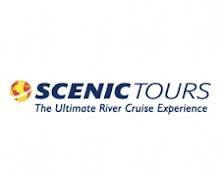 Brochures can be ordered via the Scenic Tours website or by speaking to one of their helpful advisors on 0808 115 9433. JUST 2 ROOMS LEFT ON SCENIC TOURS’ AUSTRALIA AND NEW ZEALAND TOUR!